So many of us live our lives not believing in ourselves, doubting our capabilities. Maybe we were told at school that we’d never amount to anything. Maybe someone constantly called us “stupid”. Maybe after a while we believed them and we’re still believing them decades later. But for some of us someone came along and changed all that. Someone came into our life who believed in us more than we believed in ourselves. Someone saw our strengths, our talent and our potential. You can be that person for someone else. You can change the direction of someone’s life. 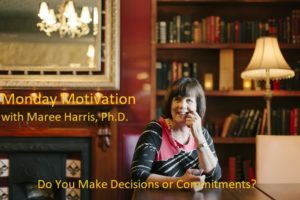 Monday Motivation October 29, 2018 Do You Make Decisions or Commitments? Why are some people more successful than others with seemingly the same opportunities – because they make commitments, not merely decisions. How many decisions have you made this year and not followed through with them? We make a start, but we don’t carry through past a few weeks with the exercise, or losing weight or stopping smoking. We start the report but after the first distraction we don’t return to it. We have a raft of reasons why we can’t do all the other things we decided we were going to do. Decisions are nothing more than ideas in our heads unless we take action on them. Commitment is the Energy that fuels our action. Self-discipline is the energy that fuels commitment. Monday Motivation October 22, 2018 – Part of the Solution or Part of the Problem? Peter Wilson, President of the Australian Human Resource Institute, has said that only 24% of employees in Australian organisations are engaged, 60% are neutral – just there but not really engaged – 16% are turned off. Not only are these statistics worrying, they raise a big question – WHY? Why do so many people in our organisations feel unable to take the action that would see them become more engaged? If you had a magic wand, what 3 problems in your workplace would you like solved? Now, I’m going to challenge you to be very honest with yourself. Have you even tried to solve them? Why haven’t you been able to solve these problems up until now? In every workplace. people complain about the problems and about why “someone” isn’t doing anything about it. Those who complain become part of the problem. The more they complain the bigger the problem becomes. Monday Motivation October 15, 2018 – Are You A Glass Half Full Person Or A Glass Half Empty One? This is not just a quirky question. It determines whether people want to work WITH your organisation or just FOR it. There is a big difference. It also draws people to you or makes them run in the opposite direction when they see you coming. No one wants to be around the person who always sees the negative in everything, the person who always focuses on the difficulty in everything, never on the opportunity. Martin Seligman, the founder of Positive Psychology, called this our “explanatory style”, the way we explain what is happening in our lives. It’s very much about our mindset. Our explanatory style, he says, determines whether we are happy in our lives or depressed, whether we are a pessimist or an optimist. People who have a positive explanatory style can explain even the most devastating experiences in a glass half full way, in a positive explanatory style. We are living in an age where depression is rife. Every year in Australia 800,000 adults experience a depressive illness. Even young children are now being diagnosed with depression. The World Health Organisation has predicted that by 2020 depression will be the second biggest health problem world-wide behind heart disease. So what’s the answer? How would things change if we began to focus on the positive in our lives? What might happen if we developed an attitude of gratitude? What if we focused on everything in our lives that we can be thankful for? Last week I conducted a group mentoring session on Self-Care for leaders in a human service organisation. While this is a most important leadership skill for all leaders in these unpredictable and changing times, the motivations that lead people to work in the human service field make it all the more challenging. I have quite a number of people on my mailing list who work in the human service sector so this blog is being written for them. Its content, however, is very relevant to all professional leaders. As human service professionals, you do the work you do because you are motivated and inspired to care for others, to make a difference in peoples’ lives, to bring empathy and compassion to them. Yet while you are busy taking care of others, you too often fail to take care of yourself. You feel self-care is an indulgence, or it is selfishness. How did we ever manage without email? It’s difficult to imagine and for those of us old enough, hard to remember what we used to do. Yet for all its benefits, it also has its negatives, the biggest being the way it depersonalises relationships. We email people in the next office, rather than go and talk with them. We email our frustrations and other emotional reactions rather than go and talk them through. We attempt to resolve complex work situations via email, rather than trying to work them out face to face, or at least by phone. We have forgotten that doing business and running sustainable and successful organisations is about relationships. It’s relationships between people that make or break a project or deal. Email is one of the most ineffective ways of building connection and engagement, of building sustaining relationships. Yes, I know that you are being told all the time to let go of the past, leave the future to the future because supposedly you have no control over it and stay in the now and make everything happen there. Sometimes, however, that can be your comfort zone area, the place where you can easily get stuck and jeopardise any future you might have. So this blog goes right against the grain because I want you to stop a moment and think about your future self. We are living in uncertain times, where on-going change is the new normal. Our lives are very busy. On the one hand we are committed to developing our professional lives while at the same time managing the many demands of our personal lives. In most families there are two parents working. We have children who are engaged in as many activities as we are as adults. Some of us have ageing parents to care about. We rush from one thing to another as we try to be all things to all people, meeting everyone’s needs except our own. This week I want you to stop and think about You and your needs and do something your future self will thank you for. Here are just a few examples for your professional and personal lives. Why is it that we so often act in ways that we know are not in our own best interests? The answer is Self-Discipline. How we hate that word! For most of us, it has all the connotations of hardship and restriction on our freedom. Is there anything “good” about self-discipline? Yes, there is, so read on. What is self-discipline? I like the definition of Elbert Hubbard: “Self-discipline is the ability to do what should do, when we should do it, whether we feel like it or not.” Self-Discipline achieves self-mastery. It puts you back in the driving seat of your life. It gives you back control. It is very empowering. There is still a perception in some people’s minds that getting a coach is a sign of weakness or even failure. I’m a professional. I’ve got so many qualifications. If I was to get a coach, people might think I’m not coping. There are other people for whom coaching is a badge of honour. It’s a sign that they are committed to high performance and to doing everything they can to develop and enhance their career. If their organisation offers them coaching, they see that as an expression of their value to the organisation, that it is an acknowledgement they have something to offer and the organisation wants to give them an opportunity to develop their talent. I recently wrote an article for LinkedIn on 9 reasons why you might get a coach. Here is an edited version.